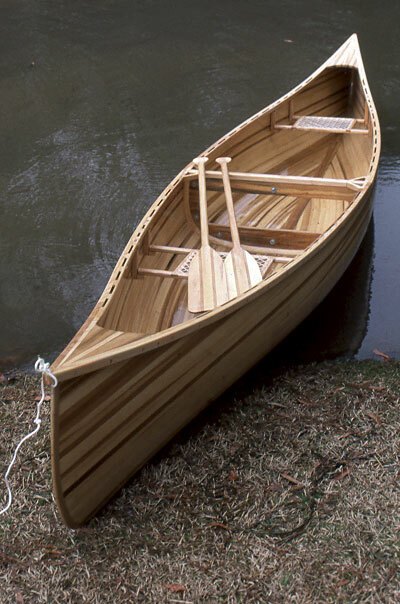 Jerry and Cheryl Morrow wanted a canoe that could be easily portaged and carried in the back of a pick-up truck, so they modified this Chestnut Prospector canoe by cutting it in half. Each half weighs 42 pounds. GEMINI is strip-built of poplar strips with ash trim. They fasten the halves together using eight bolts that join the bulkheads. When botlted together the canoe is 16'6" with a 35' beam. Plans are from Bear Mountain Boat Shop, on Peterborough, Ontario.